Rubber Baby Buggy Bumpers! Decorate with a darling baby carriage shower theme! What better represents a baby than a cute baby buggy! Go in with a group invited to the shower and get the mom-to-be that perfect stroller she's had her eye on! Fill the stroller with cute baby essentials such as diapers, onesies, wash cloths, burp rags, receiving blankets, socks, rattles, toys, teething rings, etc. Take a baby carriage shaped wicker basket and fill full of baby goodies such as stuffed animals, diapers, teething rings, baby lotion, nail clippers, booties, mittens, hats, washcloths, towels and any other baby essentials that you think the new mom might need. Wrap the basket with clear cellophane and tie with a pretty ribbon. Another clever idea is to use a large baby blanket or receiving blanket instead of using cellophane. Wrap the basket up in the receiving blanket and then secure with a ribbon. 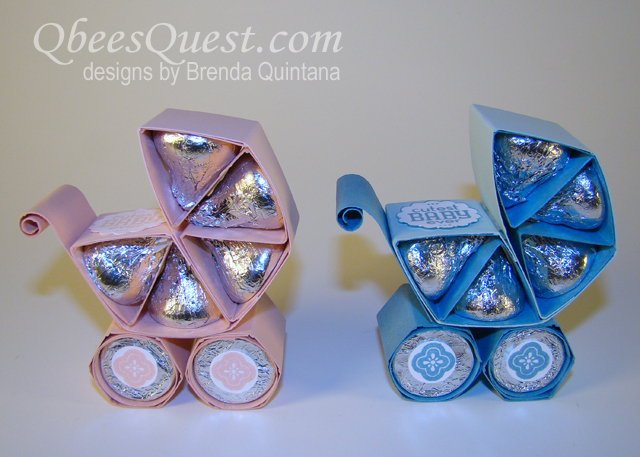 Make baby themed chocolates out of candy molds and hand out as baby shower favors! This is an easy and affordable way to give adorable favors! You can also buy some baby buggy themed scrapbook paper at the craft store and use for place mats, cut into strips and use as napkins rings or wrap a strip around candles for instant cuteness. If you have an old, vintage baby buggy lying around, (also check Craigslist or garage sales) spray paint it to match the baby shower theme and fill it with the gifts that the guests bring as they arrive. This adds so much charm and style to the shower!. The painted baby buggy can also be used as a decoration in the new baby's nursery after the shower is over. Adorable and customizable, baby carriage, baby shower favor boxes! Complete you baby buggy shower theme by handing guests some cute stroller-shaped favors as they leave! What a sweet way to thank them for coming! These baby carriage favor ideas are so creative - we have never seen them before and had to share them with you! Simply wrap each Hershey's Kiss in colored paper (to match the baby shower theme or gender of the baby,) glue together, assemble a viola! The cutest baby shower favors around! 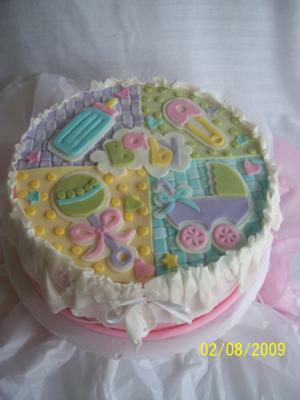 Baby Buggy Cakes (also known as baby carriage cakes & stroller cakes) are adorable and can be made to look modern or classic. If you are planning a "Baby Buggy-Themed Baby Shower" - we've got some creative stroller cakes for you to see in all shapes and sizes! This is an 8 inch and 6 inch stacked square cake. I iced each one separately with butter cream, then used an airbrush machine to spray the bottom pink and the top yellow. You could choose to cover the cakes in fondant for a similar, more smooth look, but some people don't care for the taste of fondant. So it is up to you. I think this cake turned out nicely without using fondant. I stacked the cakes and added the swirls and dot flowers with colored butter cream frosting. The cute baby stroller cake topper was purchased at a store. 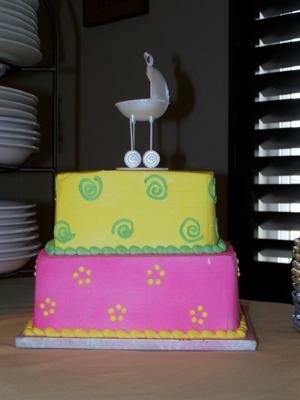 You could add any topper you'd like - whatever matches the baby shower theme. Some ideas include: a small rubber ducky, a little teddy bear, a monkey or any jungle animals. This cake is simple, but very cute! I started with three two layer cakes. 8" is chocolate cake with yummy peanut butter filling. Each cake was covered with a coat of crumb icing (butter cream) and then covered with fondant. 6 and 10" with white fondant and the the 8" I colored a hot pink. The baby buggies I cut out of fondant along with the diamonds, circles, and stripes! Pink, for a baby girl! I used pearl and silver color with my Kopykake Airbrush! Mine is the Kroma-Jet style. Oh I love that airbrush! It is very old! I have had it since 1980 and it is still going strong! Fondant takes spray color so well and dries fast. To finish it off I used French Dragees (silver size 4) to bring the silver throughout the entire cake. 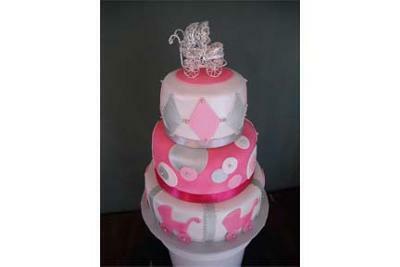 I love the old fashioned Baby Buggy on top, it is a Wilton product. I made the baby shower invitation a cake. I used a 14" round pan and two - 5" round pans. I copied the invitation and made it as big as possible. I cut the paper stroller copy in all pieces (7 in total). I cut the 14" in two halves (one half was bigger by a little bit). From the smaller half I cut 4 parts (the top of stroller, a small piece to complete the top part, the baby belly and stroller handle). I frosted all 5 parts and added the 2 smaller cakes as wheels to complete the stroller. I copied the design from a plate that was part of the decoration of a baby shower. For the cake, I baked a 10" round cake and used pink rolled fondant to cover the cake. 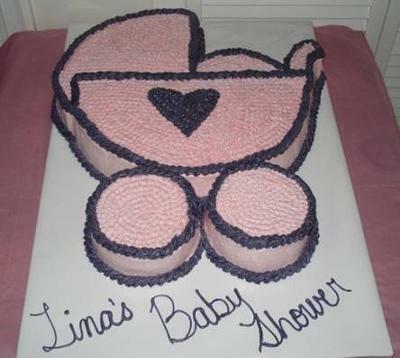 On the design on top I had the baby stroller and the baby bottle cookie cutter and the rest I cut by hand, bellow that I made the basket wave effect by cutting each stripe the other 2 squares were only dots on the fondant. 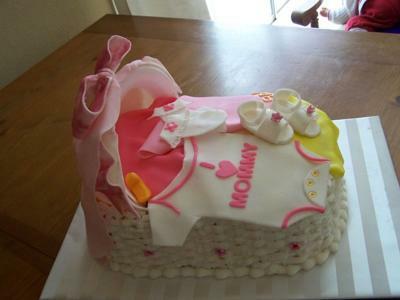 We have several cute Baby Crib & Baby Bassinet cakes for you to see!